If you are in between sizes and you like a truly tight fit then order one size down, if you have any tummy flaws, order one size up. The Audrey dress blue from Glamour Bunny is a beautifully tailored dress in a soft cotton stretch fabric with white trims and white button detail. The red bow is a lose brooch. 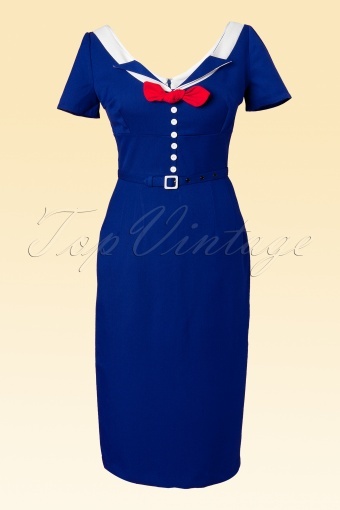 This little creation captures the pinup clothing style in this simple retro dress whilst it's careful tailoring ensures a great figure hugging fit. Zip and kick split to back. Comes with small fabric belt (not on pictures). Whether you're looking for a Mad Men Joan Dress or a Dita Dress, this little number fits the bill. Bridget Maasland wore this dress in Shownieuws and TV cook Sandra Ysbrandy in Life 4 You!! Sherry Dyanne wears our dress!